We have 2 basic fully guided options for you to experience the White Cliffs area. One is our traditional 3-7 day trip. The other is our one day White Cliffs trip by jet boat. Our 3-7 day expeditions include transportation from Great Falls to the river and back to Great Falls, floating and safety equipment, food and meal preparation, and historical interpretation. You’ll love our superb outdoor cuisine. We provide luxury camps complete with most everything except sleeping bags (available for rent), including canoes, rafts, kayaks, water proof containers, tables, chairs, tents, and knowledgeable guides that will show you the sites along the river, provide interpretation, do the cooking, camp set-up and cater to your needs. Price is per person. 6 person minimum. Enjoy this beautiful and historic stretch of river that has changed little since Lewis & Clark marveled at its “scenes of visionary enchantment.” This section of the Wild and Scenic Missouri River is famous to history buffs for its Lewis & Clark history, Native American significance, steamboat history, and for the famous artists who painted the White Cliffs area. White sandstone cliffs, volcanic intrusions, and eerie rock formations still intrigue floaters today. This is a relatively calm water trip providing lots of time for relaxation and exploration. 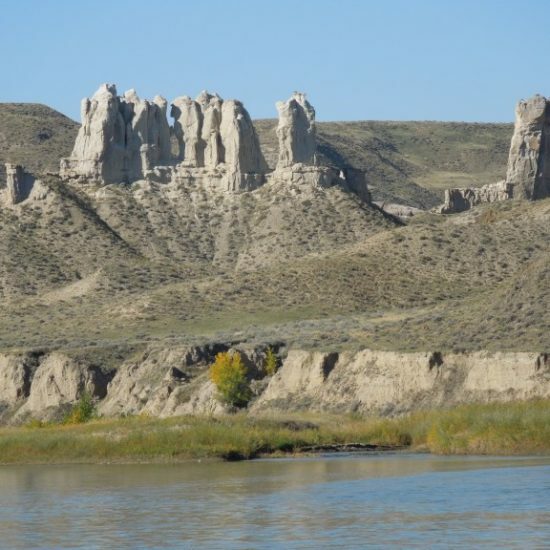 Experience firsthand the enchantment of this area with hikes to old homesteads, Native American sites, and the spectacular geological formations. Swim, fish, hike, or just relax and enjoy our comfortable, luxurious camps while your guides prepare superb meals and take care of camp chores. This area had its status elevated even further by being declared a National Monument in 2001. 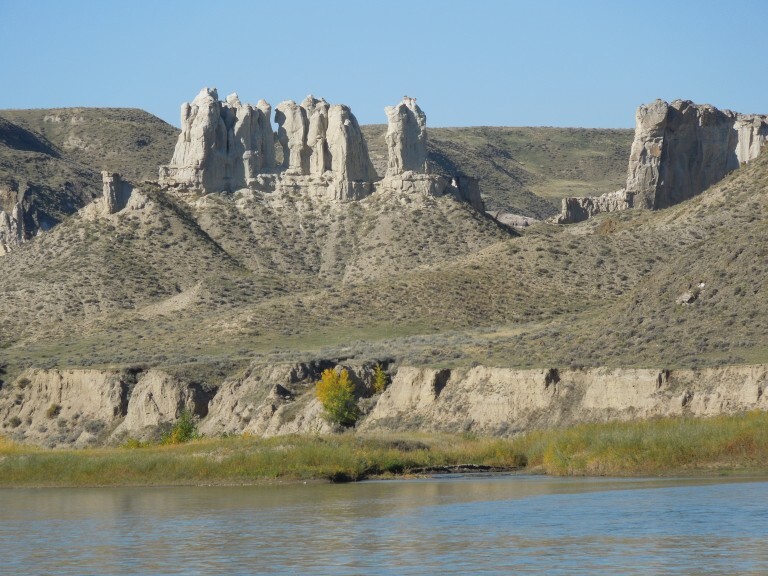 Join us on a 3-7 day river trip in your choice of raft, canoe, or kayak, and experience firsthand the outstanding qualities that set Montana River Outfitters apart from other outfitters. While this part of the Missouri is not as renowned for trout fishing as the Missouri upstream from Great Falls is, it does offer an unusually large variety of fish including, Trout, Walleye, Sauger, Smallmouth Bass, Pike, Channel Catfish, Fresh Water Drum, Sturgeon, and Paddlefish…all of these are present, most in good numbers. It is an interesting place for a fly angler to explore, or a Walleye fanatic to enjoy. The morning of your trip, the shuttle driver will pick you up at your place of lodging at a predetermined time. (If you are driving you may meet at the shop or at the put-in site). From there you will enjoy an approximate one-and-one-half hour drive to the launch area at Coal Banks Landing. The guides and crew will load the gear onto the boats, and you should be floating along the Wild and Scenic Missouri by about 11:00 A.M. 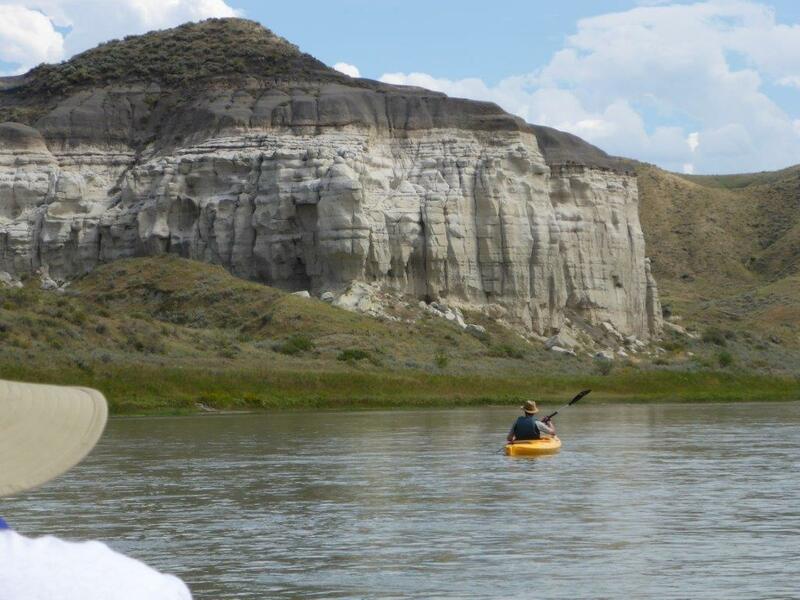 While on the river you will enjoy a moderate float or paddle of about 10 – 20 miles per day. This allows ample time to get out and explore the area. 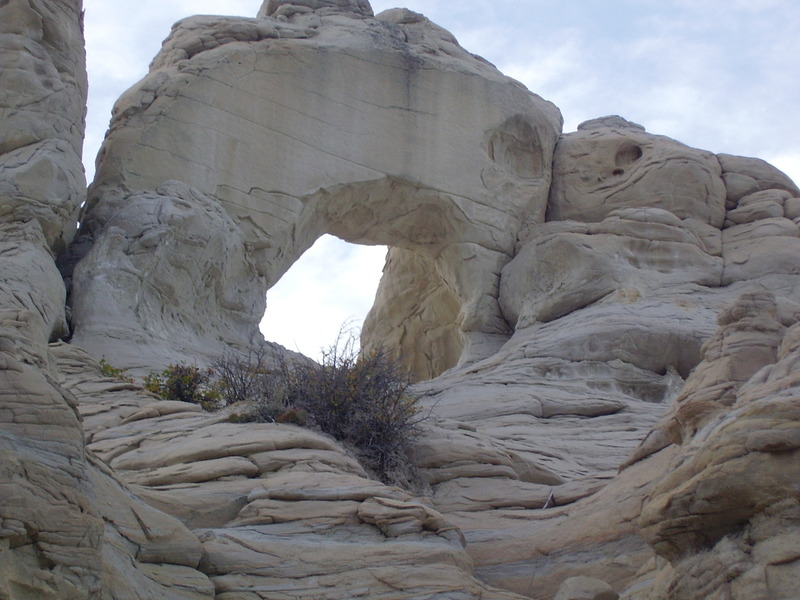 We will offer several hikes to historical sites, side canyons, vistas, and old homesteads. The guides will modify the trip to whatever extent possible to suit your needs. While on the river you will normally eat lunch around noon. Throughout the day you will have access to a cooler to keep water and soda cool. Be prepared to drink plenty of water throughout the day to prevent dehydration especially if the temperature is hot. Be sure to talk with your guides about any concerns you may have about blisters, heat or cold, sunburn, or other safety issues. You will normally arrive at camp between 4:00 – 5:00 P.M. each day. The camp will be set and ready for you and a cool (warm if needed) beverage available to reflect on the day’s experience. (Alcoholic beverages are not provided). While you are enjoying the evening, the guides/gear boaters will be busy preparing a fine riverside dinner that you will enjoy around a sturdy dining table with chairs for your comfort. After dinner and dessert you will be able to share Lewis and Clark stories, explore the area, spend time by yourself, enjoy a book from our river library, or just take in the beautiful surroundings and fine company. When you are ready to turn-in, you’ll be happy to see that your tent has been readied with comfortable cots and pads. Generally we have two people to a large tent so you’ll have lots of extra room. Wake up call for breakfast usually occurs around 7:00 A.M. After a hearty breakfast you’ll be ready to embark once again down the river at about 9:30 – 10:00 A.M. On the last day of your trip we will meet the shuttle vehicles at about 1:00 P.M at the take out at Judith Landing. After we load the boats and gear you’ll have a relaxing and scenic, approximately 2 1/2 hour, drive back to Great Falls to your accommodations. Here you can unwind and reflect back on your recent river adventures and make plans for next year. If we are meeting in Great Falls or Fort Benton, please try to arrive in Great Falls the day before your scheduled departure (if you are in need of lodging accommodations we can make those arrangements for you and offer you a variety of discounts and perks at selected motels or bed and breakfasts). If you let us know your flight arrival times we will arrange an airport shuttle for you. If you are driving, please give us a call and let us know you are in town and we will make any last minute adjustments that are needed. You may wish to visit our store in Great Falls to purchase Montana memorabilia, MRO clothing, river gear, or Missouri River maps and books and have a chance to meet us. 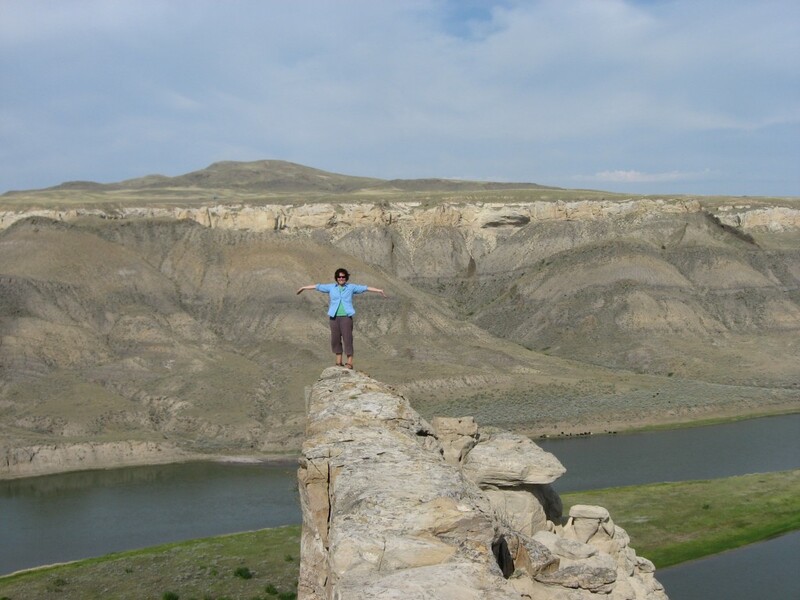 The MRO staff will be happy to provide information on area sights such as Giant Springs, the Lewis and Clark Interpretive Center, First Peoples Buffalo Jump, the falls of the Missouri, or C.M. Russell Museum. You may also want suggestions for quality dining experiences. Price is per person. 6 person minimum. 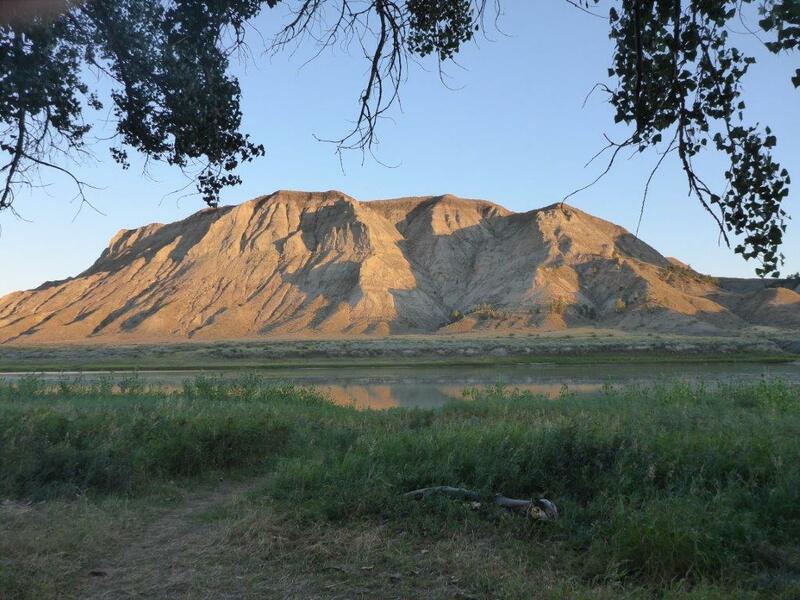 Customizable, generally guests are picked up at a motel in Great Falls at 8:00 a.m.
Casual, comfortable athletic clothing, hiking shoes, hat and light jacket. Water shoes, sleeping bag and personal necessities. 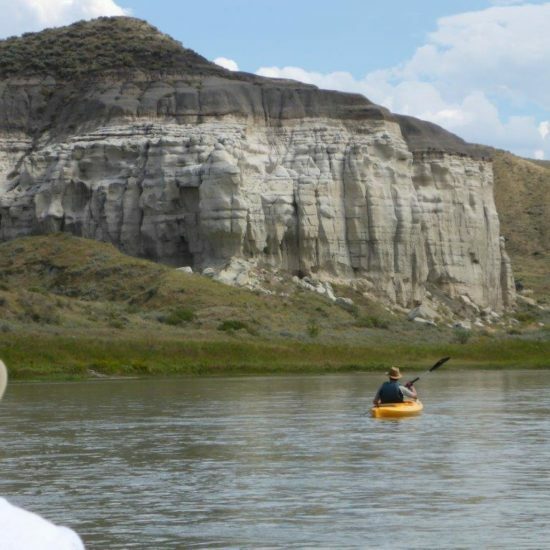 While on the river you will enjoy a moderate float or paddle of about 10 – 20 miles per day. This allows ample time to get out and explore the area. 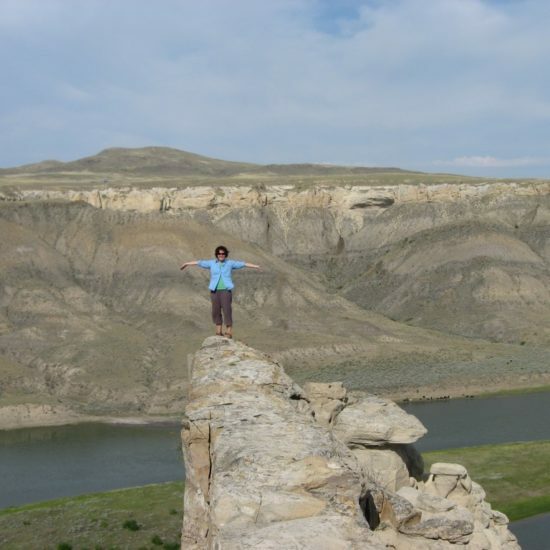 We will offer several hikes to historical sites, side canyons, vistas, and old homesteads. The guides will modify the trip to whatever extent possible to suit your needs. While on the river you will normally eat lunch around noon. Throughout the day you will have access to a cooler to keep water and soda cool. Be prepared to drink plenty of water throughout the day to prevent dehydration especially if the temperature is hot. Be sure to talk with your guides about any concerns you may have about blisters, heat or cold, sunburn, or other safety issues. You will normally arrive at camp between 4:00 – 5:00 P.M. each day. The camp will be set and ready for you and a cool (warm if needed) beverage available to reflect on the day’s experience. (Alcoholic beverages are not provided). While you are enjoying the evening, the guides/gear boaters will be busy preparing a fine riverside dinner that you will enjoy around a sturdy dining table with chairs for your comfort. After dinner and dessert you will be able to share Lewis and Clark stories, explore the area, spend time by yourself, enjoy a book from our river library, or just take in the beautiful surroundings and fine company. When you are ready to turn-in, you’ll be happy to see that your tent has been readied with comfortable cots and pads. Generally we have two people to a large tent so you’ll have lots of extra room. Wake up call for breakfast usually occurs around 7:00 A.M. After a hearty breakfast you’ll be ready to embark once again down the river at about 9:30 – 10:00 A.M. On the last day of your trip we will meet the shuttle vehicles at about 1:00 P.M at the take out at Judith Landing. After we load the boats and gear you’ll have a relaxing and scenic, approximately 2 1/2 hour, drive back to Great Falls to your accommodations. Here you can unwind and reflect back on your recent river adventures and make plans for next year.